The content and information included on this website has been compiled by The Wicked Stitch of the East, Inc from a variety of sources. We reserve the right to change the content and the information on this website at any time. This website is provided for information purposes only and the content is made available "as is". We make no representations and do not warrant that any information and content on the website is comprehensive, complete, verified, or accurate. We accept no liability whatsoever for any loss or damage caused by you or your reliance on any content or information on this website. All content and materials available on www.wickedstitch.com, including but not limited to text, graphics, website name, code, images and logos are the intellectual property of The Wicked Stitch of the East, and are protected by applicable copyright and trademark law. 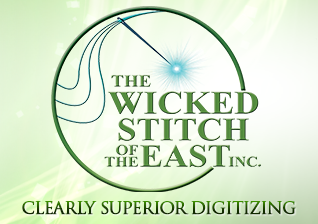 Any inappropriate use, including but not limited to the reproduction, distribution, display or transmission of any content on this site is strictly prohibited, unless specifically authorized by The Wicked Stitch of the East, Inc.
All orders placed at The Wicked Stitch of the East will be delivered via email or uploaded on the Wicked Stitch website. We do not physically deliver. The Wicked Stitch of the East, Inc., does not sell, distribute or lease your Personal Information to third parties unless are required by law to do so. We do use third parties to maintain and store your Personal Information and to process your payments to us. However, these affiliates are not authorized to use your Personal Information for any reason than providing the requested service. We digitize all designs from original artwork. We will edit, free of charge, sizing or other adjustments for a quality sewout. If you are not satisfied with quality, we will refund. As a service to you and for your convenience, this Web Site may contain links to web sites operated by third parties. By providing links to third party web sites, Company is not endorsing or sponsoring such third parties or their web sites. You agree that Company is not responsible for the availability of or content on any web sites operated by third parties that may be accessible through or linked to this Web Site.